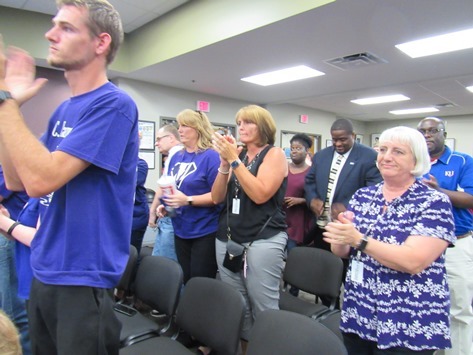 KCK school board brings in outside superintendent – Welcome to Wyandotte Daily! 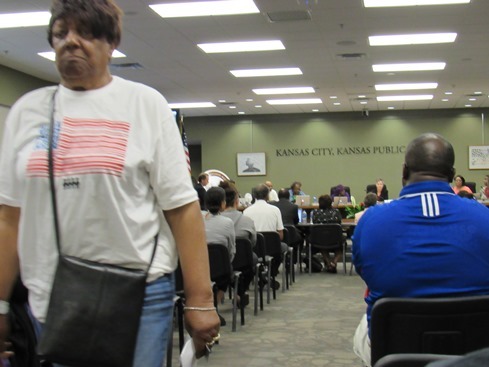 The Kansas City, Kansas, Board of Education went outside its own organization tonight to hire a new superintendent, Dr. Charles Foust, currently in Monroe, North Carolina. The vote was 5-2, with board president, Brenda Jones, and board member, Janey Humphries, voting no. A gasp went through some of the audience as the board made its selection tonight at the district’s Central Office, 2010 N. 59th St. More than 100 people attended. The other superintendent finalist was Dr. Jayson Strickland, deputy superintendent of the KCK school district. Speakers who had supported Dr. Strickland during the audience communications segment of the meeting had received a lot of applause. Randy Lopez, one of the speakers during the audience portion of the meeting, said the district has talked about growing its own candidates, and today it had the opportunity to walk that talk. He said the district needs someone in the superintendent’s position who is committed and shares the community’s values. Neither of the candidates listed prior experience as superintendent, although they both have many years’ experience in administration and teaching. Dr. Foust is the chief school performance officer from Union County Public Schools, Monroe, North Carolina. Before that, he was a school support officer for Houston Independent School District, supervising and mentoring principals and managing programs that increased the number of graduates while improving reading and math scores. He also has served as a principal, assistant principal and curriculum facilitator, besides classroom teaching experience. 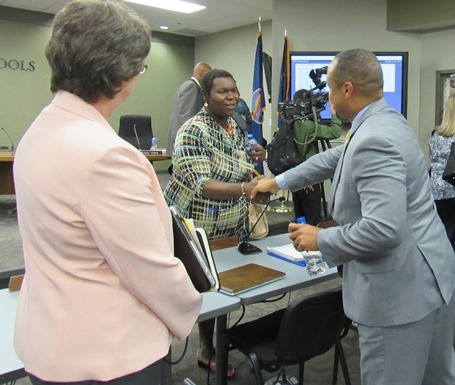 Dr. Julie Ford of Topeka will be the district’s interim superintendent in July, serving until Dr. Foust takes office. Board members were not sure when Dr. Foust will start. Dr. Winn said her top goal for the district would be to increase student achievement, student assessment and ACT scores. “We will have to serve as ambassadors and help the new superintendent build trust,” she said. Dr. Foust had a plan, and his dissertation was on a college readiness program similar to the district’s Diploma+, she said. “He’s going to have to win the trust of the community, and be open and honest,” she said. “The fear of change is people just don’t know.” One of the goals is to be open and honest, do what works, and keep it moving, she said. Dr. Winn said she looked at Dr. Foust’s record of turning low-performance schools around, and his plan to come in and help provide dedicated resources for tutors, for hiring more teachers, and reducing class sizes, all the things they know that work to increase achievement, she said. While a lot of people at the recent board meetings and meet-and-greet sessions supported Dr. Strickland, Dr. Winn said that they also have heard other opinions. She said other members of the community, who are not so emotional and were not there tonight, have said the district needs to change. They need to take what works, and keep doing it, but a lot was not working, she believes. Dr. Winn said there is an undercurrent right now that probably will not go away. “We’ll continue to get nasty emails, we’ll continue to get harassed,” she said. But at the end of the day, she said what will make a difference is that they will have to move that needle of the student scores. 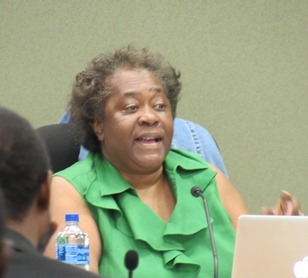 One school board member, Wanda Paige, received a negative message telling her to resign last week, with the person who sent the message stating false information that she was not eligible for the board. However, Paige, who is eligible for the board, did not resign and instead reported the message to the authorities. Dr. Winn said she knows there is a lot of work to do to bring the community together, and there will be more listening tours to communicate with residents and patrons, and ask their views. “We have to be ambassadors and we have to deal with facts,” Dr. Winn said. “That’s part of the problem with the emotion in the room.” It’s something they will have to address. 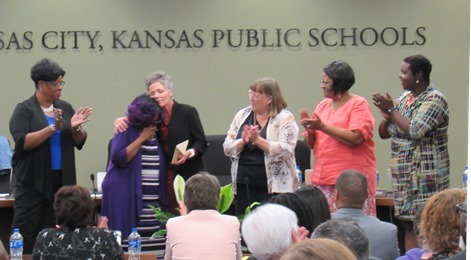 Board president Brenda Jones and Janey Humphries were nearly in tears after tonight’s vote. Humphries said during the vote that she looked at both candidates’ qualifications and thought both had very good qualifications. “We always talk about how we grow our own, but we didn’t pick our own,” Jones said after the meeting. “The majority of the board voted for Dr. Foust, and we need to work together for the best of our children,” Humphries said later. J.D. Rios, a former administrator with the school district who was in the audience, said he was not surprised at the vote. “What I’m hopeful of is that the community continues to be engaged, keeping vigilant on what the board and administration are doing,” he said. He is hoping that the district’s progress can continue. The Kansas City, Kansas, school district, besides losing Dr. Cynthia Lane to retirement, is also losing David Smith, who has served as chief of staff, to the Shawnee Mission School District, where he will be chief communications officer. 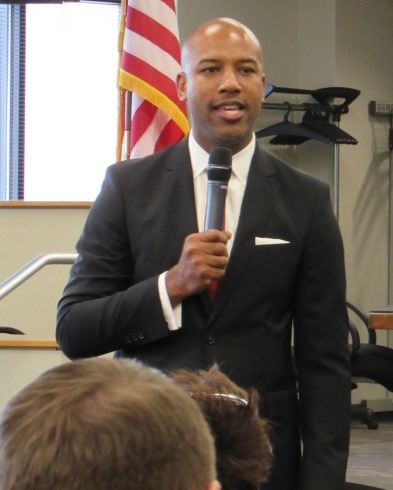 During his 13 years in the KCK district, Smith, a former middle school teacher, served in roles that included being the spokesman for the district and chief of communications. He is a former assistant superintendent for communications of the Kansas City, Missouri, School District. The board also called a special budget meeting for 5 p.m. July 3.